It's 2002 in Silicon Valley. 9/11's still fresh, the dot-com bubble has burst, and holy calamity is raining down on 14-year-old Chad Loudermilk. His father is about to lose his job, his mother isn't the same since Chad's grandma died, and as one of the few black kids at tony Palo Alto High School, Chad's starting to wonder about his birth parents. Next door lives dot-com mogul Scot MacAvoy, with his luxury SUV and his gardeners and his beautiful wife and his time to play video games with Chad, all making the Loudermilk family's struggle to stay afloat seem that much harder. It's going to be a tough year for the Loudermilks. 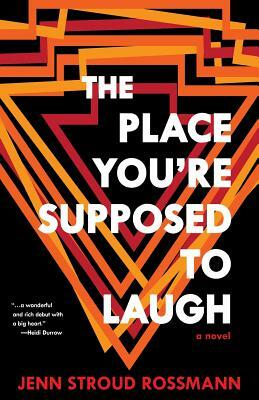 THE PLACE YOU'RE SUPPOSED TO LAUGH is wise and witty novel about the Silicon Valley that's not covered in the fawning features in The New York Times. It's a place where the working class, blended Loudermilk family grapple with issues of race and inequality, all while trying to keep a smile on their faces. In the spirit of the works of Celeste Ng and Angela Flournoy, this is a big-hearted page-turner that will make you laugh, cry, and think all at once.